'MLM' The American Dream Made Nightmare: 'MLM/Prosperity Gospel,' the most pernicious, and profitable, form of cultism operating in the world today. 'MLM/Prosperity Gospel,' the most pernicious, and profitable, form of cultism operating in the world today. Due to the vast number of people it has deceived, exploited and silenced around the globe during the previous 50+ years, and the mountain of cash it has unlawfully generated (and continues to generate), the so-called 'MLM/Prosperity Gospel' is without doubt one of the most pernicious, and profitable, forms of blame-the-victim cultism operating in the world today. Indeed, I would go so far as to say that, due to their growing number and level of infiltration of traditional culture, 'MLM' racketeers represent perhaps the greatest threat to democracy and rule of law, of any latter-day cult instigators. Although cryptic warnings about this type of exploitative, esoteric ritual belief system can be found in the Bible (e.g. the 'Golden Calf'), its contemporary, bedazzling 'income opportunity' camouflage has been perfectly-tailored to reflect the spirit of the times. Whilst it almost goes without saying that selectively-blind, professional 'scholars of religion' (like Britain's Eileen Barker at 'INFORM,' America's J. Gordon Melton, etc. ), have completely failed to identify, let alone inform anyone about the hidden dangers lurking inside this 'commercial' variation of the age-old cultic, Trojan Horse. Since 1989, UK tax-payers have been funding, via the UK government's Home Office, a registered charity known as 'INFORM,' housed at the London School of Economics, Dept. of Sociology. In recent years, 'INFORM' has been receiving around £140 000 annually of public funds. Part of this has been used to assemble a labyrinthine 'data base,' allegedly to provide free and objective, up-to-date information about 'cults and New Religious Movements,' for legislators, academics, law enforcement agents, members of the public, etc. Thus, through the constant repetition of the thought-stopping word, 'religion,' the obvious truth that (in the hands of narcissistic criminals, and/or criminal psychopaths) the phenomenon of self-perpetuating, non-rational, esoteric, ritual belief systems, can be easily perverted for the clandestine purpose of human exploitation, has been excluded from UK government policy for more than 20 years. Readers of this Blog should take note that, contrary to what the members of 'INFORM' have implied, no phenomenon can be accurately defined (arbitrarily or otherwise, and certainly not by a country). However, all phenomena have universal identifying characteristics. Indeed, as George Orwell proved, once you know how they work (by dissociating their exploited-victims from external reality whilst giving them the illusion that they are making free-choices) all totalitarian deceptions (which are reality-inverting constructions of twisted human minds) can be deconstructed by one universal allegory. The reason why I took the trouble to follow Orwell's example, by setting down the universal identifying characteristics of a pernicious or criminogenic cult, is so that when any free-thinking individual employs the word 'cult,' there can be absolutely no doubt as to what he/she means. Sadly, whilst the members of all-encompassing organizations like 'INFORM' grudgingly accept that some crimes have been committed by the adherents of some 'religious movements,' they also continue to include in their 'doublethink' view of the cult phenomenon what narcissists, and megalomaniacal psychopaths, claim to have been doing, in apparent ignorance of what they have actually been doing (i.e. steadfastly pretending moral and intellectual authority whilst pursuing various hidden criminal objectives - fraudulent, and/or sexual, and/or violent, etc.). In reality, the inflexible members of groups like 'INFORM' who have obstructed and denigrated intellectually-rigorous common-sense inquirers into the cult phenomenon, have been a significant part of the problem and not the solution to it. Currently, 'INFORM's' unjustifiable public-funding (which last year was reduced by 75%) is under further review. 'XanGo is a privately held Utah limited liability company started in October 2002.
holds itself, as well as its distributor force, to the DSA’s code of ethics. As ever, it is interesting to note that the precisely-worded document which the 'Xango' bosses sent to the FTC, doesn't actually say that anyone has ever generated an overall net-income lawfully by regularly retailing 'Xango's' effectively-unsaleable wampum (i.e. $40 per bottle fruit juice) to the general public for a profit, because that would have been a direct lie. Furthermore, if giving stolen millions to charity is proof of honesty, then Bernie Madoff should not be in prison today. Again, when the wider-evidence is examined, reality-inverting documents like this, are clearly part of a centrally-controlled, criminal attempt to further shut-down the critical and evaluative faculties of US federal trade regulators, in order to obstruct justice. Therefore, they form part of the same pattern of ongoing, major racketeering activity (as defined by the US federal Racketeer Influenced and Corrupt Organizations Act, 1970, and clarified by subsequent US Supreme Court Judgements). 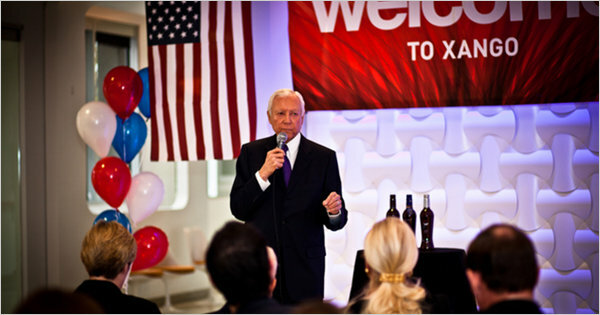 Orrin Hatch at the 'grand opening of Xango's energy-efficient HQ' Lehi, Utah. Perhaps the most significant (and predictable) omission from the 'Xango comment' to the FTC of 2006, is its bosses' extensive financial connections with the leadership of the 'Mormon Church' and with the venerable 'Mormon' Senator for Utah, Orrin Hatch. Although it doesn't seem possible, faced with flocks of abusive 'MLM' shepherds and their financially-suicidal, bleating sheep, instead of holding their nerve and achieving their objective, senior FTC officers ignored their duty of care to the American public and ran-up the white flag. So-called 'MLM schemes' were suddenly exempted from the 'deceptive business opportunity rule' R5II993 which the FTC had specifically proposed to regulate 'MLMs' in the first place. However, several former, senior FTC officials are now to be found bleating in the 'MLM' fold. In their new, much-more-highly-paid capacities as attorneys acting for 'MLM' racketeers, three former FTC officials, Timothy Muris (FTC Chairman 2000-2004), J. Howard Beales (FTC Director Bureau of Consumer Protection, 2001-2004) and Joan Z. Bernstein (FTC Director Bureau of Consumer Protection, 1995-2001), submitted obstructive documents to the FTC hearings in which they opposed the wording of the new 'deceptive business opportunities rule' (Muris and Beales were ostensibly acting for 'Primerica Financial Services' and Bernstein for 'Amway'). Thus, an effectively-toothless new FTC 'rule' was introduced at the start of 2012 which requires anyone in the USA selling a 'business opportunity (other than an 'MLM') to supply anyone buying that 'business opportunity,' with a one page disclosure-form which must include: evidence to support any earnings claims, a list of any previous legal actions against the sponsoring company, and a declaration of the company's cancellation/refund policy. In other words, although they are obviously not described in accurate deconstructed terms by current FTC officials, this 'rule' specifically excludes 'MLM Prosperity Gospel' cults from regulation and effectively places their bosses above the rule of law in the USA. Sadly, FTC agents have completely failed to recognise 'Prosperity Gospel' cultism as a form of major, ongoing racketeering activity, because the FTC has itself foolishly allowed the instigators of these gangs to register their criminal activities as 'direct selling/MLM' companies: 'Amway', 'Herbalife', 'NuSkin', 'Xango', etc. However, in the adult world of quantifiable reality, no evidence exists (in the form of audited accounts; particularly, income-tax payment receipts) proving that a significant number of the constantly-churning adherents of any of these organizations (which all have exhibited the universal identifying characteristics of a cult) has ever received an overall net-income from lawfully-retailing goods, and/or services, directly to the general public for a profit. 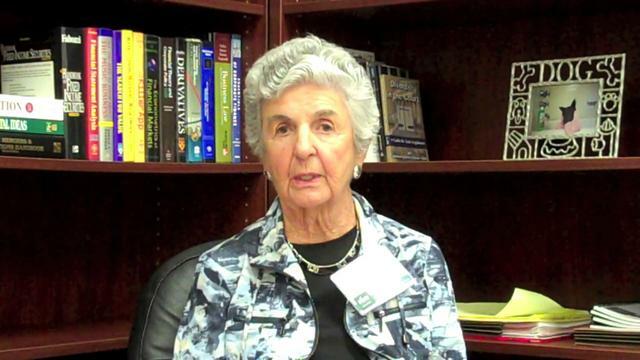 David Vladeck's largely-empty rhetoric was also repeated by another leading FTC attorney, Eileen Harrington. Obviously, it is a perfect description of 'MLM income opportunity' fraud, but these laudable words were part of the FTC's ironically-titled initiative, 'Operation Empty Promises' which, unbelievably, has not targeted any of the most-pernicious 'MLM' mobs. Meanwhile, the US Dept. of Justice, which (due to its previous, let's turn a blind-eye to businessmen, policy) is now sinking in a sea of fraud, has recently announced the following impressive-sounding initiative - a 'consumer protection working group to combat consumer fraud.' In plain language, this translates as: large numbers of US Justice Dept. attorneys now have a further pretext to keep holding 'conferences' at the expense of their employers whom they have failed to protect. Judging by their previous, shameful track-record, legally-qualified, senior US government officials, would appear to be some of the last people in America who should be tasked with coming up with solutions to fraud. Self-evidently, the only common-sense legislation which could have halted 'MLM Prosperity Gospel' cultism in the USA many years ago (and before it became a global problem), would have been to have made it a fundamental requirement for the instigators of all alleged 'direct selling/income opportunities' to produce quantifiable evidence to prove that they have had a significant and sustainable source of revenue other than that deriving from their own participants. Had such common-sense legislation been enacted and rigorously enforced, then, since 1970, if the instigators of any alleged 'direct selling/income opportunity' had been unable to produce such elementary proof of the economic viability, and legality, of their alleged 'commercial' activities, they could have been immediately arrested by FBI agents, their labyrinths of counterfeit corporate structures closed-down and all their illegally-acquired assets seized, under existing RICO legislation. Out of all the alleged 'multi-billion dollar direct retail sales ' claimed by you and your member companies in the USA down the years, exactly what percentage have been authentic, external, retail transactions to members of the general public for a profit, rather than internal transactions between your member companies and their many millions of alleged 'business owners,' but which have been laundered as 'retail sales' by you, and by your member companies, in order to dissimulate the operation of closed-market swindles from which the ill-informed ordinary contributors cannot have hoped to receive any more money than they paid in? Excluding all your own member companies' documentation, and that issued to their alleged 'distributors,' what quantifiable evidence can you produce proving that any of your member companies' alleged 'Multi-Level Marketing income opportunies' have actually had any significant, and sustainable, external source of revenue other than that deriving from their own participants?